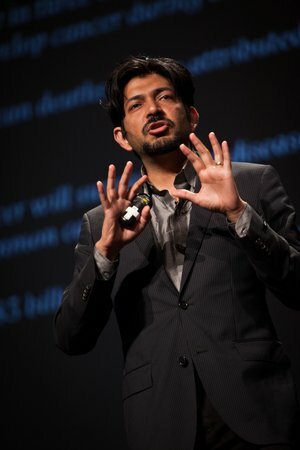 Siddhartha Mukherjee, MD, DPhil, struck Pulitzer Prize gold with his first book, The Emperor of All Maladies: A Biography of Cancer, in 2010. His third book, The Gene: An Intimate History, explores the central role of heredity and the ethical conundrums posed by the growing ability of scientists to rewrite our genomes. An assistant professor of medicine at Columbia University and staff cancer physician at Columbia University Medical Center, Mukherjee will deliver his plenary session at 8:45 a.m., Nov. 6, at Learn Serve Lead 2017: The AAMC Annual Meeting in Boston. He talked about the changing role of physicians and medical researchers in the “art of medicine” as new technologies challenge ethical norms and augment the human role in diagnosis and treatment. “This talk is very much about the future of our profession but also the future of patients—what it means to be in this arena,” he said. You describe medicine as an intersection of art, science, and technology. How does the art fit in? One of the challenges of the new era of medicine is how to retain what we used to call the art of medicine—how patients are treated individually, humanely, humanistically. How can we incorporate the flexibility of practice, the possibility of intuition, the possibility of deviating from protocol within the bounds of safety? In The Emperor of All Maladies, you describe the fervor of advocates of radical mastectomy a century ago despite the lack of evidence that the disfiguring surgery was necessary. Is there a lesson for contemporary medicine? It’s a lesson that we constantly have to learn, which is to realize that fervor in medicine is simultaneously a dangerous and powerful thing. If you look at that history, doctors were driven by a real desire to conquer breast cancer. The patients were driven by a real desire to beat this illness. And yet this fervor turned into something very scary, very disturbing. So the lesson is how to keep medicine from committing those same sins again. We’re in the middle of thousands of trials. How can we have true equipoise, at the same time without dulling the fervor that allows [us] to invent new procedures? People are clamoring that the FDA and regulatory authorities are working too slowly and to release these life-saving medicines faster. We must constantly remember that good medicine lives in a balance between that fervor and intellectual honesty—what works and doesn’t work, what harms and doesn’t harm patients. In a recent article for the New Yorker, you explored the future of artificial intelligence and machine learning in diagnosis. What’s in the future? That article talks about some of the amazing things that artificial intelligence and deep learning can bring into medicine, particularly into diagnostics. Computers can know facts. Deep learning would take us in diagnostics from knowing facts to knowing how—figuring out how to help in diagnosis. But it’s the third realm of knowledge that doctors will still retain and [what’s] hard for even the most ambitious deep learning programs to understand. I call that “knowing why.” Understanding mechanisms, understanding pathophysiology, devising experiments, devising clinical trials, and ultimately, understanding human beings. This goes back to the point of the art of medicine. We will increasingly depend on deep-learning systems to know how, leaving open to the field of medicine to ask questions about why. Those are ultimately human questions. As machines learn more and more, will humans learn less and less? What happens when humans are pushed aside bit by bit? Humans have unique capacities for knowledge. We will learn different things. We will learn about cause. We will devise experiments. We will hopefully create new molecules. We will invent new systems of care. We will use machine learning to understand the flows in the systems of care through pattern recognition. But to invent a new system requires a creative process. Why are we unable to deliver the best possible medical care to the widest number of people in a wealthy country? We can analyze those system flaws powerfully through deep learning. But to solve them requires a kind of creative process. The faster we adapt to the shifting role [in medical education], the better it is for everyone. Researchers at the Center for Embryonic Cell and Gene Therapy at Oregon Health and Science University published their work this summer on using CRISPR to edit the genomes of human embryos. Embryo research has proven to be highly controversial. How should we be forging policies to establish a framework and avoid divisiveness? There are a lot of questions thrown open by the experiment in Oregon. The whole community is analyzing this, trying to figure out whether there are off-target effects, whether it’s safe, whether these embryos have really manifested genetic change, whether there are unanticipated consequences. Those are technical questions, and it’s important to note we still haven’t gone through or solved some of the major technical questions. Second is a set of ethical questions. In the book The Gene, I proposed a kind of triangle of ethical considerations: One, is the genetic change directed toward a disease that truly causes extraordinary suffering? Number two, is there enough evidence that altering that gene will in fact, in a one-to-one way, affect the disease? How likely is it that the genetic change will manifest itself as a physical feature that will ameliorate the disease? And number three, can we justify using this? Are there other ways that we can treat the disease without intervening on genes, human genes? People will propose other ways of thinking about these changes in the future, but we need to have a consensus, because this is not just any ordinary science. We are making changes in our own human genome. Is it reasonable to think that physicians and scientists can address the difficult questions raised by CRISPR technology, or is it destined to be resistant to consensus? I don’t think it has to become a slugfest. I think we have to be careful about criteria and talk through these questions thoughtfully. It’s an important area. Medical education is at an important crossroads, given all these technologies. And it’s an exciting time to think about how to teach a new generation of doctors how to think about medicine.